Do you feel the same way I do? Where Christmas is just a month long crazy thing after another? I loved this month though. We had a lot of fun times and I was sad when Christmas was over. It is kind of a let down when its all through. These pictures are completely out of order, but here are some of our Christmas happenings... We always go and visit our Dad/grandpa's in the month.Here we are at my dad's. Visiting our dads at Christmas is a special way to remember our Savior at this time of year. Someday, because of the way our Savior provided, we can be together with these people that we love and miss so much! I'm not sure why these pictures look the way they do, but we went to the Idaho Falls Museum to see their Christmas display where they have lots of Santa's, gingerbread houses, and Nativities. It is free to get in and every cool! Here's Mack ringing his triangle at the Christmas concert. It was such a cute concert. Calli had a speaking part and did such a good job and then they both had performances to do with each of their grades. So darling! I got two....TWO pictures on Christmas morning. It was a special, fun morning with just our little family. I think the kids enjoyed everything that they got. Christmas Eve we were at the Nelson's home and we were playing our new favorite game, Dicapades. Jeff drew the card that said you needed to arm wrestle the person to your right and he was a little nervous that it happened to be Becky...He won though...Phew! Here's the BOYS Christmas morning. Christmas Eve- Jeff and Stratton-so cute! Alex and Andy! Oh jeez! Look at these grown, handsome men. When Jeff and I got married they were 5 and 7!!! Yikes! I am getting old! Christmas Day, we went over to my mom's to hang out with her and my Sister Sara and her family. It was so great to have them here! We don't get to see them enough because they are far away. It is special when they are here! Here I am with the most adorable little Jack! He likes me. Most of the time. 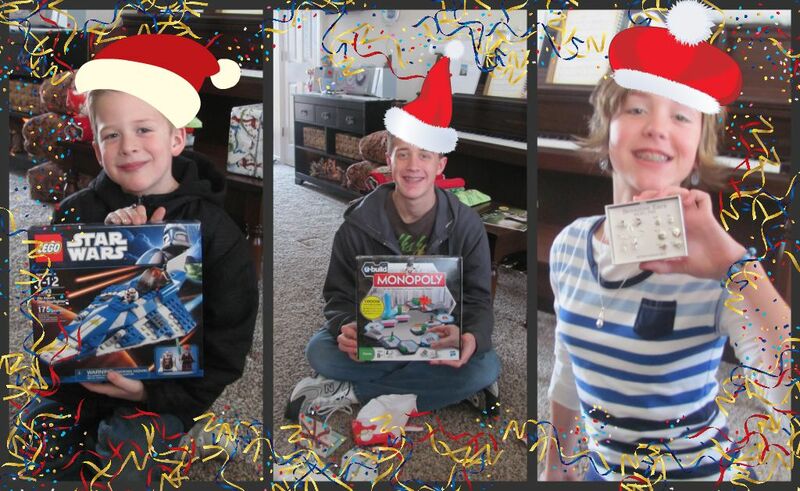 Here are the kids with their gifts from my mom. So fun! Mom got the perfect stuff that fit them wonderfully! Quentin, Olivia, Emily, and quesadillas for lunch after the big sleepover party at our house! Here we are at Galen's. So fun. I love the dynamics of your kids. Keep up the good memories of your dad! What a great family you have. I love reading your posts. Before I start pouring my heart out let me just comment on Mac's blue gloves that is priceless. I can't look at your blog without getting a lump in my throat cause I reallllly miss the day to day connection. Knowing all the fun and cute things you are up to I can't stand it why did you have to move. I think you are the most awesomest person ever. It was great to catch up on your darling family! Looks like your holidays were so good and even better the inner peace & quiet you have sounds wonderful. Sure love you! Come visit anytime!